A gyro tower, or panoramic tower, is a revolving observation tower with a vertical moving platform. A gyro tower's observation deck is not simply raised to provide its passengers a spectacular view, it is also rotated around the supporting mast, either once in the raised position or while traveling up and down the center mast. Gyro towers are seldom part of funfairs but can be found more often in permanent amusement parks. 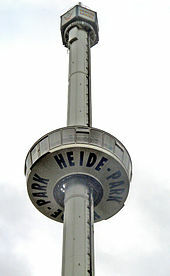 A well-known American gyro tower is the Kissing Tower at Hersheypark. 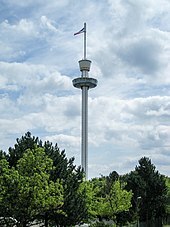 A special gyro tower is the Space Tower atop the Euromast in Rotterdam. It may be the only gyro tower standing on a roof of a structure and not on the ground. Carolina Skytower, Carowinds, North Carolina/South Carolina, U.S.
Sky Cabin, Knott's Berry Farm, Buena Park, California U.S. Kissing Tower, Hersheypark, Hershey, Pennsylvania, U.S.
Star Tower, California's Great America, San Jose, California U.S.
Sky Tower, SeaWorld San Diego, San Diego, California U.S.
Sky Tower, SeaWorld Orlando, Orlando, Florida U.S.
Sky Trek Tower, Six Flags Great America, Gurnee, Illinois, U.S.
Space Tower, Minnesota State Fair, Falcon Heights, Minnesota, U.S.
^ Haidet, Ryan (September 13, 2012). "Space Spiral demolished". WKYC. Archived from the original on December 8, 2012. Retrieved September 15, 2012. ^ Johnston, David (November 5, 1989). "Sky Tower is Blasted Into History". Philly.com. Retrieved September 15, 2012. This page was last edited on 24 March 2019, at 07:04 (UTC).